Neist Point Lighthouse: Best Sunset on Isle of Skye? One of my favorite things to do is watch the sunset. There is just something relaxing about it and I never cease to be amazed by Mother Nature. I try to plan some sunset time whenever I travel. When I was researching my trip to Isle of Skye, Scotland, I read that by the Neist Point Lighthouse was the best place to watch the sunset. I wanted to see it for myself! 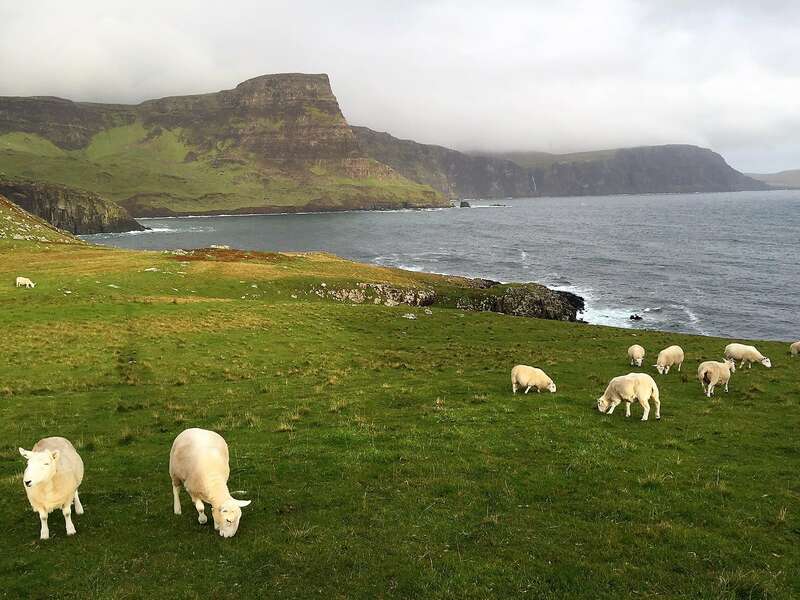 After going to Neist Point, I can confidently say you need to add it to your itinerary. 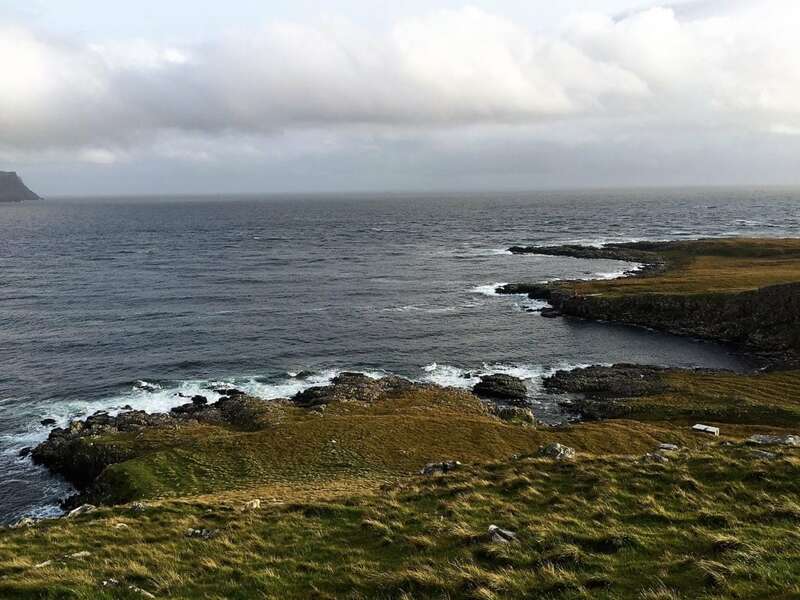 Let me tell you about our experience and give you some tips for visiting Neist Point. The Neist Point Lighthouse with the sun trying to shine through the clouds. Was it the Best Sunset? Neist Point is located on the most westerly tip of Isle of Skye near the township of Glendale. It was about a 40-minute drive from the B&B where we were staying and the drive there was quite an adventure. Since it is on an isolated part of the island, you have to go on one lane roads to get there. This road is meant for two way traffic but it is barely wide enough for one car. Just a few minutes before we reached our destination, it started pouring. We debated about just going back to the B&B, since we wouldn’t be able to see the sunset with this weather. I know in Scotland the weather can change quickly, and we had driven all the way there so we thought we should at least explore a bit. 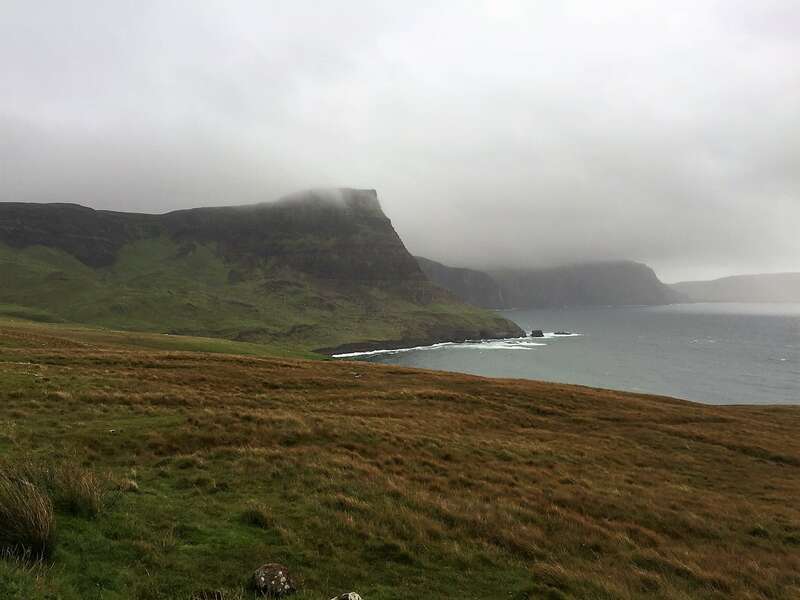 Even with the bad weather, Neist Point is a beautiful place. We put on our rain jackets and got out of the car. It was rough out there, very windy and heavy rain. We headed to the beginning of the trail. The Neist Point hike starts with lots of steep steps going down. Again I was tempted to turn around but we had come all the way there, plus the scenery was so beautiful. We started down the steps holding on tight to the handrail. A few minutes later the rain miraculously stopped! All of a sudden the stairs didn’t look quite as steep. Once we got to the bottom of the steps, it was an easy walk to the Neist lighthouse through sheep pastures. Well not sure if it was a pasture, there were sheep roaming freely around us. I loved watching the sheep. They seemed like they were trying to talk to us and some had personality! The path goes right by the sheep. We came to see the Neist Point sunset but I didn’t realize how beautiful the area was going to be in its own right. The cliffs were absolutely stunning and reminded me of the west coast of Ireland. I loved the intense green with all the sheep too. Pictures don’t do it justice! 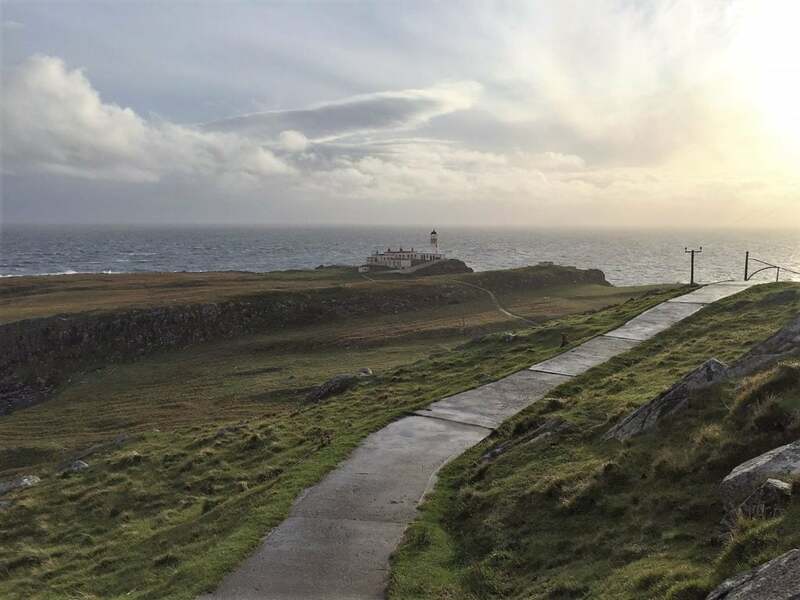 So even if you can’t make it at sunset time, I would definitely add the Neist Point Lighthouse walk to your Isle of Skye Itinerary. I love the rugged coastline. The Isle of Skye has several lighthouses, but some say that the Neist Point Lighthouse is the most dramatic. It was built in 1900 and has since been updated to an automated lighting system. The light is 140 feet above sea level and can be seen up to 16 nautical miles offshore. The keeper’s cottages that surround the Neist Lighthouse main tower are privately owned. For a few years, they were holiday rentals, but they don’t seem to have been used for a while. If someone would fix them up again, I would love to spend a weekend staying at the Neist Point lighthouse bed and breakfast! 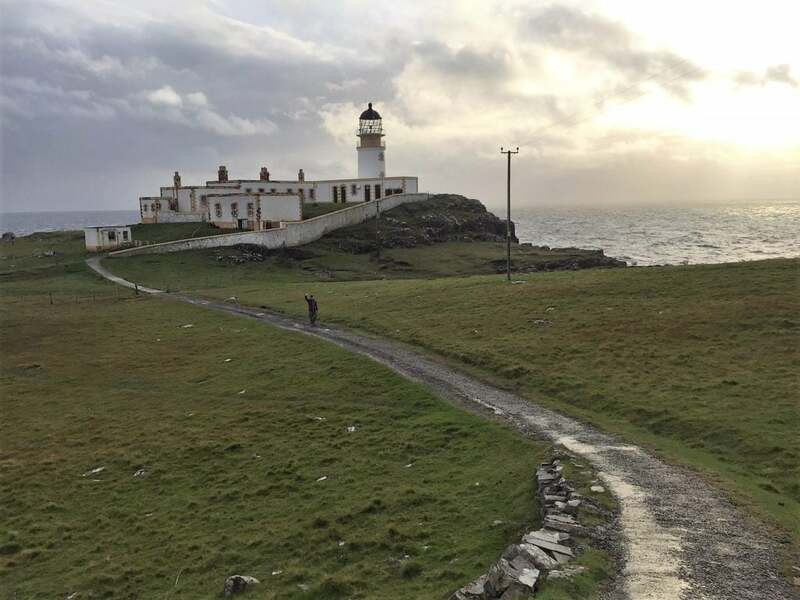 How neat would it be to sleep inside one of the most famous lighthouses in Skye! You can see the Neist Point Lighthouse in the distance. It’s about a 20-minute walk, not counting time for pictures, from the parking lot to the Neist Point lighthouse. You use the same path to return to your car. The only part that is difficult is climbing the stairs back up to the parking lot. There is a nice handrail, but the stairs are steep. Please be careful hiking to this Skye lighthouse if the weather conditions are not ideal. 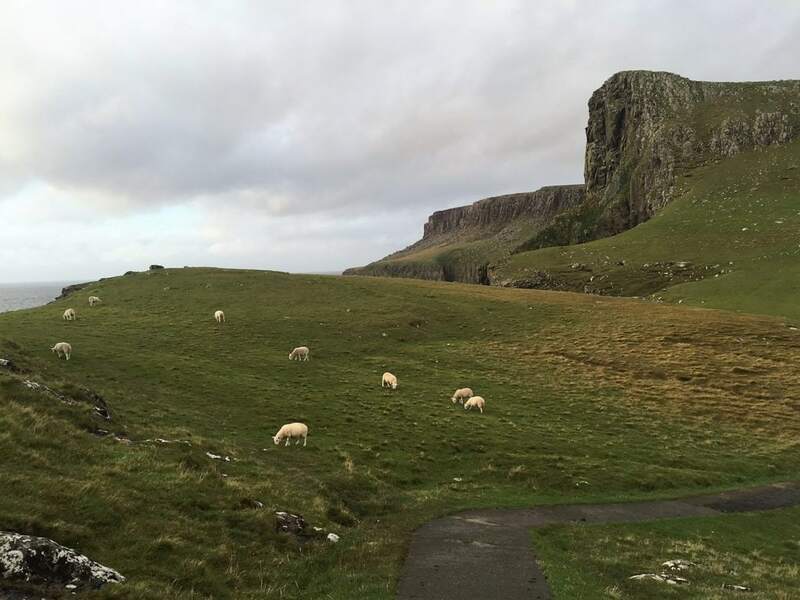 The sheep make Neist Point even more special. It ended up being a bit too cloudy for us to get a good sunset. Still, I enjoyed my visit. The area is so beautiful and definitely doesn’t need a sunset to make the visit worthwhile. I will definitely go back to Neist Point next time I am on the Isle of Skye and see if I can catch the lighthouse at sunset. I would also like to visit the other Isle of Skye lighthouses. I have also heard that Talisker Beach is a lovely spot to watch the sunset on Skye. It’s about a 35-minute drive from Portree to the Talisker Beach parking lot, then it’s a 20-minute easy walk to the beach. What other sunset watching places do you have on your list? I would love to hear about them in the comments. 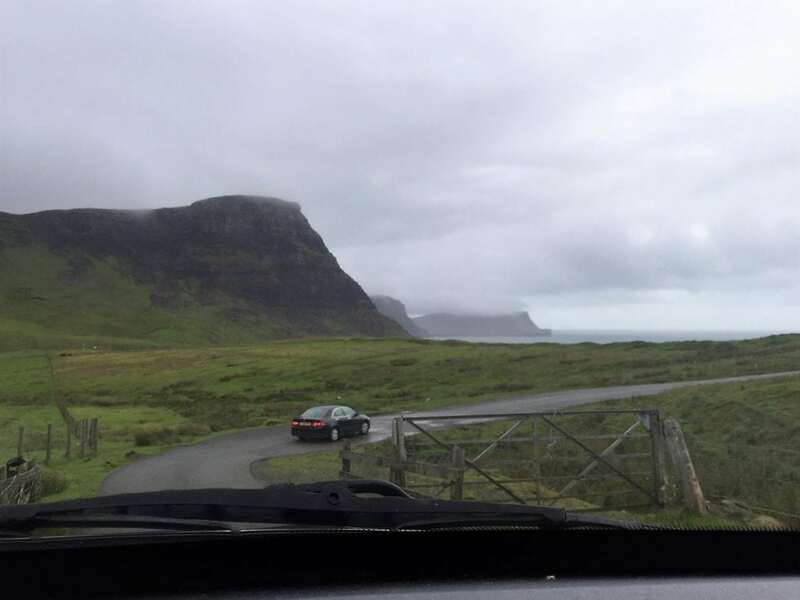 Be prepared for the single lane road that you have to drive on to get to Neist Point Scotland. Make sure you understand the driving rules. Wear proper shoes as the beginning and end of the hike are steep. Neist Point is worth a visit even if you can’t make it for sunset. Tanja – Thanks so much! Yes Isle of Skye is amazing. I hope you get the chance to go! I’ve heard so much about the Isle of Skye and yet the pictures still surprise me! One of these days I will finally get to Scotland! Leigh – It really is an amazing place! Definitely add it to your list for when you make it to Scotland. Lorna – I hope you get the chance to visit. I know you will love it. Scotland is on my shorter bucket list; just waiting til my littles are a little older before we head to Europe. I am enjoying all your posts on it and will be cataloguing get them for for future planning purposes. Very beautiful. I love the sheep on the hillside. Amanda – Thank you. Yes, I am sure your kids will appreciate it more when they are older. Scotland is so beautiful and there is so much to see. How beautiful! I’ve never made it to Scotland, and I don’t like the rain, but those beautiful hills and cute sheep are calling me. I could definitely brave the damp and cold for views like that. Thanks so much Staci. Yes, it really is such a beautiful place! Watching sunsets is one of our favourite things to do and you’re right Mother Nature is amazing, but unfortunately doesn’t always behave as we would want it! Does look a beautiful part of the world to visit, thanks for sharing. Thanks guys! It really is a beautiful area. I hope you get the chance to visit. Thanks Sarah! I really loved the sheep too, they made the spot extra special. What a romantic spot. These pictures are so beautiful – it must have been breathtaking in person! Cynthia – Yes! If only the sunset would have cooperated. It really is a beautiful place, though. I hope you get the chance to visit. This is called as beauty of nature. What an amazing place to visit. Nice pictures. Yes, it really is a beautiful place. So glad you liked the pictures. Some lovely (what I imagine to be typical of that area) scenery for your drive. Sally – Yes, thanks, it is such a beautiful area! Thanks Laura! There is just something about sunsets! Haha yes they found a lovely home! What an incredibly scenic spot! I’m glad you didn’t turn back because I’m really enjoying the photos you took. The light in that first photo with the lighthouse is fantastic. Thanks so much Michele! So glad you enjoyed the photos, I hope you get the chance to visit one day. This is a spectacular spot. Excellent for hiking or a road trip! Agness – Thank you. And yes I agree its a great place for hiking or doing a road trip. I hope you get the chance to go there.